CM Storm aims to provide gaming enthusiasts with the ultimate gear to assure them victory. Featuring a smooth and clean aesthetic, the QuickFire XT comes equipped with ultra-durable mechanical Cherry MX switches, guaranteed to survive at least 50 million taps. The Embedded Steel plate, NKRO support, and key-combo functions all ensure that you never miss your opportunity to win. Ultra-Slim Design With its ultra-slim body and elegant style, the QuickFire XT offers comfortable, ergonomic typing angles, and takes up little space on the desktop. Green Mechanical Switch The Cherry MX Green is both a tactile and a clicky switch. You can both feel the tactile bump, and hear the "click" that occurs, when the activation point is hit. N-KEY ROLLOVER FUNCTION and Adjustable Command Rate The QuickFire XT can have multiple keys pressed at the same time through a PS/2 connection without conflict, providing an incredible advantage for gamers. In PS/2 mode, the command rate can also be adjusted via key combos. Multimedia Shortcuts via Key Combos Take total control of your music and video playback easily with key combos. Detachable Braided Cable The detachable braided cable with a full-size USB plug prevents tangled wires, and provides extra flexibility for your keyboard positioning. Game Mode Disable your Windows keys to prevent accidental interruption of your gaming sessions. 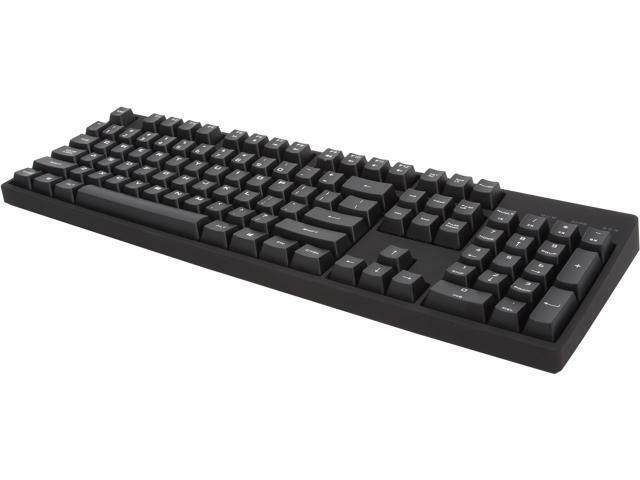 Pros: I have the compact, ten-key-less version of this keyboard, which Newegg is not stocking right now. They should. The build quality on these CM Storm keyboard is excellent -- better than the Razor mechanical I have with Cherry MX Blues. I really like the Cherry MX Greens for typing, because they are stiffer than the Blues and require more force to actuate. I am not the world's best typist, and these greens help me to avoid inadvertent keystrokes. If you like clicky keyboards, give this one a try. Cons: Not really a Con, but for the price of this keyboard most would come with a full LED light up keyboard. This one does not light up. Other Thoughts: This keyboard is amazing. I got exactly what I was looking for in the cherry mx green switches and I don't have any complaints. It feels good, sounds good and operates smoothly and perfectly. Pros: Worked great out the box! After reading review after review, I bought it and it was a great buy. On a side note, shipping was faster than expected. Cons: I took off one egg because of the lack of accessories and no back lighting. I would really love this keyboard if it included a hard angled wrist rest like comparable keyboards from other manufacturers do. To be a 5 egg keyboard I personally feel it lacks in two areas and that's backlit keys and that removable wrist rest. It is a much better build quality than the other keyboards I have owned (razer deathadder and blackwidow, logitech g110 and 710 and corsair k70). All are solid, deathadder is kind of weak, keyboards but this one feels like higher quality. 1 out of 3 people found this review helpful. Did you? Pros: Great feel (love the greens! ), minimalist design and branding, optional Windows Lock for gaming. Only branded in one place. Cons: None. A bit pricey - but you pay for quality. Other Thoughts: Great keyboard for when I'm working and works well for gaming. I like the fact that it isn't overly branded or gaudy. It looks like a quality mechanical keyboard. Wish they would have included an extra USB cable (Pretty sure that would not affect the margins on this product at all). Pros: This KB was everything I was lookign for and expected, I went with MX Greens do to the force they take, and I personally love the sound. It's not a flashy backlight board. Its just a simple all you need. Cons: None, the newegg page tells what it has and what you could expect out of it. The only small thing that bothers me about it is no menus button, its a function button, but menu button is hardly used by any one so I wont knock and egg off for that. Pros: SO CLICKY! Guess that's why I bought MX Greens! Comes with some Red Arrow keys to be mounted in WASD, pretty cool. Cons: No LEDs... especially at this price. Pros: -MX Greens feel just how one would expect Greens to feel. -Keyboard is very high quality. Does not move when typing, does not flex, smooth gliding. -Easy to change keycaps. While this is more of a Cherry standard, changing the entire set of keycaps is quite easy. -Putting the windows lock led with the main three leds (maybe above it) so it isn't so bright when playing. Other Thoughts: Cherry MX Greens are my perfect switch and I'm so glad that Cooler Master made this (and other models I believe) of affordable MX Green keyboards. If I couldn't get Greens, I would have gone with Blues which felt way too light for me. Really is a nice keyboard, and I get comments asking if its a Filco! Very happy with this keyboard.